Posádková věznice is apparently the scene of the plot of two entire chapters. Both [I.8] and [I.9] takes place in and around the garrison prison. The first part is set in the sick-barrack of the prison, then moves on to cell no. 16. Švejk's escape starts in the chapel when during holy mass field chaplain Katz takes to Švejk and consequently employs him as him officer's servant. The prison is first mentioned at the end of [I.7] and it is said that this is where Švejk is going. Amongst the people Švejk met during his imprisonment are: Dr Grünstein, baroness von Botzenheim, captain Linhart, the warders Slavík, Řepa and Říha - and at the very end: the military prosecution represented by Bernis. Posádková věznice is the author's term for C.a.k. vojenská věznice v Praze (K.u.k. Militärgefängnis von Prag), a prison that was part of the garrison complex at Hradčany. It shared the building with the garrison court and the Landwehr court. The building is located behind Loreta; and was opened in 1896 and is still in use, but not publicly accessible. It's function as a prison and brutal interrogation centre was revitalised during the Nazi and Communist dictatorships. See also Vojenský soud. In 1906 there were two Stabsprofusen employed at the prison, but none of them were named Slavík, Říha, or Řepa. The two were Jan Frkal and Josef Bureš and they lived on the premises. If any of them was a model for the literary figures is impossible to say. It can not be historically determined if the author had anything to do with the garrison prison at all, so we must assumed that the inspiration for those figures hailed from elsewhere. On the other hand it is possible that Jaroslav Hašek had heard some story from former inmates of the prison. The description of the conditions in the prison and the brutality of the warders all in all appears strongly exaggerated. There is every sign that the author was not very familiar with the organisation of the garrison. There is contradicting information on where Švejk actually was: at Vojenská nemocnice Hradčany or in a sick-bay within the prison. One passage indicates that the author believes that the military hospital was part of the prison, which it clearly wasn't. In chapter nine the reader gets the impression that the garrison actually WAS the prison, which it wasn't (at most "garrison" was a colloquial term for the garrison prison). [1.8] Švejka v posádkové věznici do nemocničního baráku právě mezi takové malomyslné simulanty. Vojenská nemocnice Hradčany is mentioned by Grünstein when he asks Švejk if he enjoys his stay at the military hospital. It is however unclear if the hospital is part of the plot at all, as the information about Švejk's stay amongst the malingerers at Hradčany is somewhat contradictory. In other parts of the text the reader gets the impression that it is talk of a sick-bay that is part of the garrison prison. See Posádková věznice for more on this topic. Vojenská nemocnice Hradčany refers to a branch of K.u.k. military hospital no. 11 in Prague. It was located in the same barrack complex as the garrison prison, the military court, and other army institutions. 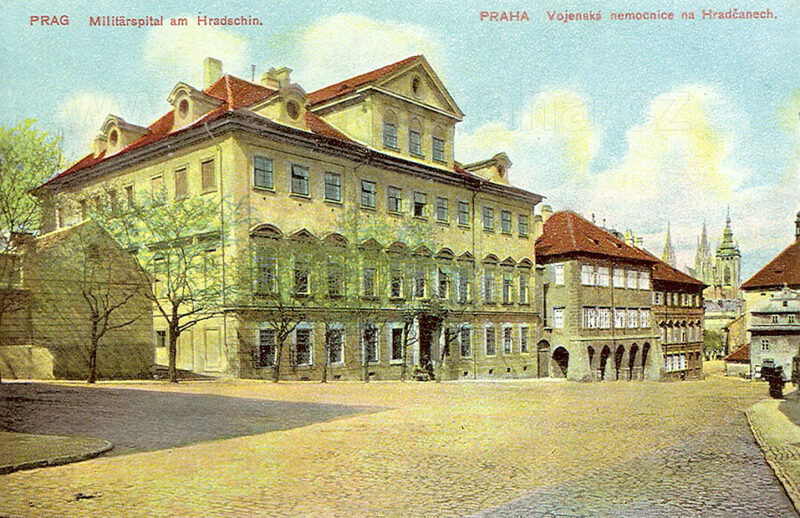 The main military hospital in Praha was Vojenská nemocnice Karlovo náměstí. Chief staff doctor in 1916 was dr. Křejčí as revealed when newspapers reported on a visit by Countess Coudenhove, the wife of Bohemia's governor. The visit took place on 10 April 1916, too late to fit chronologically with the visit of baroness Botzenheim, but nevertheless there are interesting similarities. [1.8] Druhého dne při visitě otázal se dr Grünstein Švejka, jak se mu líbí ve vojenské nemocnici. Švejk odpověděl, že jest to podnik správný a vznešený. Československá Republika is mentioned during the visit of baroness von Botzenheim at Hradčany where she gave Švejk the book Episodes from the life of our emperor that was written by the future editor in chief of this paper. Československá Republika was an official government daily newspaper that was published by this name from 1919 to 1932. It was a direct successor to Pražské úřední noviny, and was even located in the same offices. The mentioned editor, Otakar Filip, had been an working for the paper also during the old regime. From 1932 to 1938 it continued publishing, but now using the name Pražské noviny. The government's newspaper group also issued Úřední List Československá Republika and the evening paper Prager Abendblatt (in German). Jaroslav Hašek also wrote a satirical article in Rudé Pravo where editor Filip and his newspaper is treated in more detail: What I would advise the Communists if I were the Chief Editor of the official Government newspaper Československá Republika. The article was dated 7 April 1921 printed on 8 May - around the time when the passages in the novel were written. In the article he claims that some Svátek was editor in chief, in the novel the author of the book about the emperor (i.e. Otakar Filip) has this role. According to the address book from 1924 the chief editor was Josef Hevera, and another of the names mentioned in the Rudé Pravo article, Adolf Zeman, was indeed on the editorial board. The article furthermore suggests that Jaroslav Hašek was still a Communist at heart. [1.8] Potom vytáhla z koše tři láhve vína pro rekonvalescenty a dvě krabice cigaret. Vše elegantně rozložila na prázdnou postel vedle Švejka, kam přibyla ještě pěkně vázaná kniha „Příběhy ze života našeho mocnáře“, kterou napsal nynější zasloužilý šéfredaktor naší úřední „Československé republiky“, který se ve starém Frantíkovi viděl.